- Gain experience by taking 8 practice tests and receiving estimated scores. - Raise confidence by reviewing concepts, test-taking approaches, and practice questions. - Increase understanding of the new PSAT/NMSQT® and the new SAT. Plus, book buyers receive free online score reports and a discount on The Official SAT Online Course(tm) with auto essay scoring. - The name of the current SAT verbal section will be changed to critical reading, analogies will be eliminated and short reading passages will be added to existing long reading passages. - A new section called the SAT writing section will be added, which will contain multiple-choice grammar and usage questions and a student- written essay. 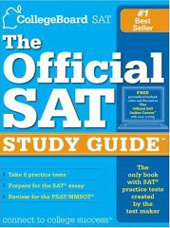 - The SAT math section will be expanded to include topics from third-year college- preparatory math (also known as Algebra II); in addition, quantitative comparisons will be eliminated from this section.The Official SAT Study Guide: For the New SAT is part of the College Board's new SAT Readiness Program(tm) of print, online, and professional development resources. 미국내의 대학입학준비를 위한 수험생에게 추천합니다. 본 코스에서는 레벨구분이 적용되지 않습니다.